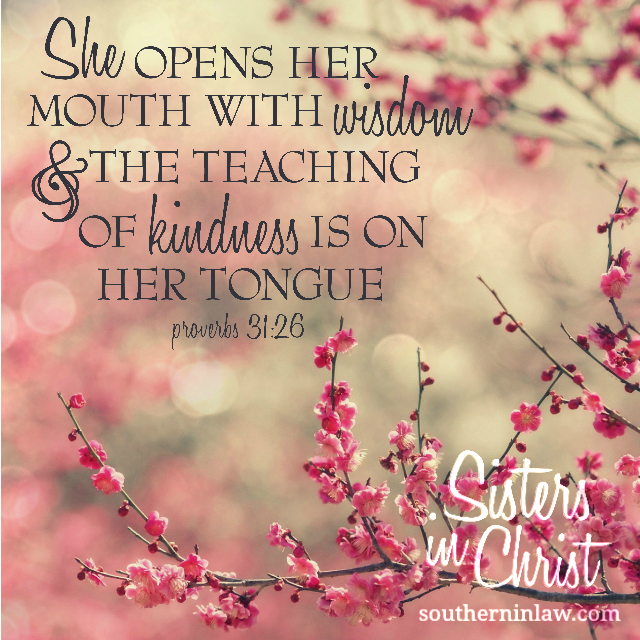 Southern In Law: SIL Sisters in Christ: What Does it Mean to Be a Godly Woman? Week Two! 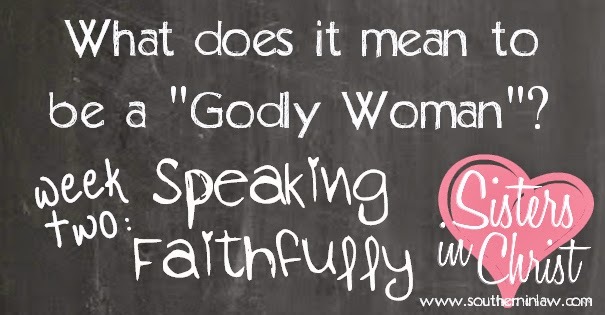 SIL Sisters in Christ: What Does it Mean to Be a Godly Woman? Week Two! Well hey there, beautiful lady! Yes, you! I'm glad you've stopped to read this post today because it's fulllllllllllllll of goodness. Last week I launched a new series on the blog, Southern In-Law Sisters in Christ and it seems like those of you who read the post loved it! I've loved getting emails of computer screens and phones around the world with last week's inspiration verse and I've loved reading your comments and emails (but all of you ladies who emailed me - don't be too shy to comment as it's an incredible opportunity to talk with other women like you!). This week we're still looking at What it Means to Be a Godly Woman and we're focusing on what it means to speak faithfully. *Those with asterisks I think are incredibly important and encouraging - if you don't want to read them all, at least read these ones! This week is a little bit tricky. You see, the term speaking faithfully can be taken in a number of different ways. This week we're taking inspiration from Proverbs 31:26 as I really believe the Proverbs 31 woman was a woman who spoke faithfully. Speaking faithfully is probably something we all forget or overlook. We live in a world where the bleeps on TV are pretty constant and where if we're not swearing, we're replacing words with stand in words that fill the void. A few weeks ago at our bible study we were talking about those replacement words and what they really meant. We realised that some of the terms we thought were okay (think; crap, heck, sugar, darn, etc) were actually still interpreted by others as swear/curse words so they were really just as bad as saying the actual word. That conversation made me think a lot. As a woman of God, I try to be someone who is loving to all, however, the words that come out of my mouth aren't always loving. Whilst I am pretty patient, I can get a little snappy when I'm tired or frustrated - I won't necessarily swear, but I may say something I don't mean. We all do it. Call it what you will - snapping, barking, yelling, cursing, nagging. We all have those moments where the words that come out of our mouth are bitter and twisted instead of loving and gentle. Whilst the saying says "Sticks and stones may break my bones but names words will never hurt me" we all know that words do hurt. You hear them echo in your mind. They cut deep into your heart. You know the person might not mean it, but in that moment those words sting. We forget just how much our words effect people. I'm not perfect, by any means... There are too many times where kindness isn't the first thing off my tongue. I know better, however, my wisdom disappears and haste takes over. But lately, I've been focusing on speaking faithfully and being more loving and haven't I noticed a difference! Put yourself in my shoes in this scenario; I'd just come in from a long day of meetings and work. I was exhausted but I had to make dinner before heading off to run our youth group. I was spoken to in a tone I didn't like and I was told something I didn't agree with and I..... breathed. I took a big breath in, reminded myself to speak with kindness and wisdom and I said nothing. I let it slide. Usually I'd bite back - and I'd probably get myself and the other person cranky for no reason at all. That situation has happened over and over and over again in the last couple of months and every time I've held my tongue. As you probably know, I live in a household of five adults - it's pretty quiet and it's easy for someone to get on your nerves - but I haven't had an argument with anyone. I haven't gotten myself upset over a silly little thing because I just let it slide. The Lord doesn't tell us to speak with love, kindness and wisdom for no reason.... He's telling us because He wants us to be happy. He wants us to be the woman that others admire for her kindness - because it's that women that brings people to Him. There's good news, sisters. You might be realising you don't speak faithfully and lovingly as often as you'd like to - but that's okay. God's grace is new every morning - and I'll tell you what, I need it every day and you do too. Every single day we're renewed and we can start again with the hope of growing, learning and becoming the women God created us to be. But how can we speak faithfully in our day to day lives? Think before you speak. How many times have you heard that from your mother/father/grandmother/etc?! They were right. We need to learn to slow down and think before we open our mouths. Instead of reacting, we need to respond. Seek wisdom from the Lord. Spend time in His word each day seeking his wisdom and talk to Him every day. He's there waiting to help us - we can't become a Godly woman on our own. We need Christ and His strength to work in us. Pray that God will make you more sensitive to the words that come out of your mouth - as well as the tone in which you use. Ask Him to remind you daily that we are to do all things for His glory. Ask yourself why you react in the way that you do and what benefit it has. By working out the why, we can change how we do things. What comes out of our mouths usually shows us what is going on within our hearts. Breath instead of whining, snapping, complaining or accusing. Rather than reacting in this way, think about how you can calmly improve the situation (because afterall, you know that snapping just causes an argument and whinging and whining never motivates anyone to do anything joyfully). Don't take your bad mood out on others. We've all said something that we regret because we mix bad words with bad moods. You can transform your mood, however, you can't take back what's been said. Practice self control with your emotions. Watch sarcasm and critical - they usually reveal a bitter, envious, selfish or angry heart and never help anyone. Try to filter your words. Don't curse or swear. Is it really necessary to fill the air with words that really don't have much, if any, meaning? What example does that set to those younger than us? It's tough because we live in a world where these words have become common place, but they're really not doing anything for us. Purify your heart by reading God's word and asking Him to help you put aside all anger, bitterness, envy, self-pity and malice. Hey Robin, I'm so glad this post helped you as well! You are definitely right - we are role models to those younger than us (and really, anyone around us! We rub off on our friends and elders too!) so we always have to be careful with what we say. Hot off the presses, inspired by you! working a fairly full on full time job, managing a home together and balancing ministry is HARD work. I love it but sometime my patience do run thin. A couple of things that have help focus and slowly change.…. Being in Gods word, and starting my day off right! This however means…early to bed and early to rise (ahead of the kids!) There is so much ‘good’ in In this era of social media and information when it’s used well; it means I can soak in Gods word anywhere! On the same theme, here are 2 pieces which I’ve found really helpful this year. Hey Trish! You're not kidding, life in general can be so hard at times! I'm going to check out the links you added now! The internet is such an awesome resource. Music is therapy. Music moves people. It connects people in ways that no other medium can. It pulls heart strings. It acts as medicine. See the link below for more info. These are truly wonderful ideas in concerning blogging. You have touched some pleasant factors here. Any way keep up wrinting.